Three things stand out immediately when you meet Lulete: her optimism, her warmth and her sense of urgency. These traits make her a gifted speaker and activist in her work as Director of Community Impact at the Women’s Foundation of Minnesota. 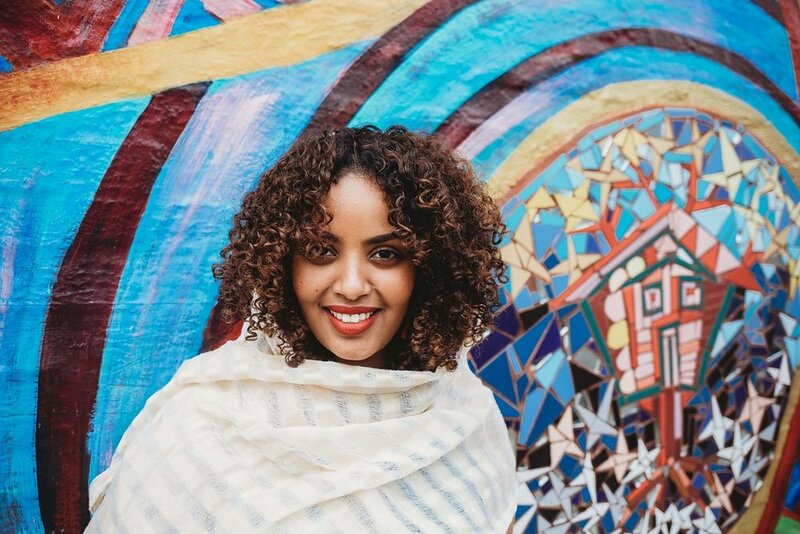 She also leads political engagement and professional development initiatives in Minnesota’s East African community and is active in the Movement for Black Lives. 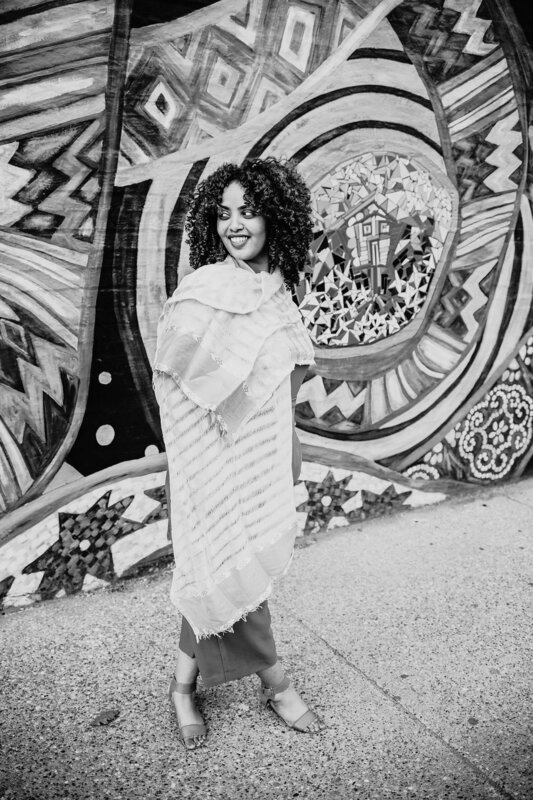 Born in Addis Ababa, Ethiopia and raised in St. Paul, Minnesota, Lulete stepped into social change work at age fifteen as a sophomore at St. Paul Central High School and hasn’t looked back. You’d never hear this from her directly, but I’m guessing she holds a record for most fellowships and honors received by any twenty-five-year-old. I guess that’s what happens when you’re simultaneously a force and a ray of sunshine. You better *believe* you’ll keep seeing her name -- that’s if we don’t lose her to New York, Atlanta or Washington, DC. In fact, you will see her name on business cards her mom hands out (more on that in a minute). How did you get your start as an activist and philanthropist? I’m a St. Pauler. I grew up in St. Paul, went to St. Paul Central and college at the University of Minnesota. I’ve been doing social change work since I was fifteen. I got into this work of wanting to see a better world for women and girls through my mother. She had a lot of struggles of her own and I always just saw her persevere and be resilient through it. But I knew that no matter how much resilience she had, the world and systems were not set up so that she could be okay. I knew there must be another way. Survival can’t be the only way for women like my mother to get by in this world. At fifteen, I started a group called SHE, which was a young women’s leadership group at Central. I gathered all my friends and we would meet to talk about domestic violence, body image, beauty, leadership and what we wanted to do in the future because at that time, so much of our energy was focused on the wrong things. I would have my classes, I would have my part-time job and I would have SHE. It became a thing. It continued on after I left and it was replicated at Woodbury High School and additional high schools in the state. I also started it with friends and classmates at the University of Minnesota. That experience taught me I can be an organizer. I could get people around a cause and if I frame it in the right way, if I approach it right, people will respond and be mobilized for change. And it was easy. It was easy for people to do good. Doing good for folks isn’t something you have to beg and plead for. It was so interesting, we would ask to borrow clothes from high-end stores for fashion shows and donate the proceeds to the Women’s Advocate Inc, the first women’s shelter in the U.S. located in St. Paul. We would go to these high-end stores and we would ask them for their clothes. We were kids from the city going to high-end stores and you’d think they would have wanted to speak to our parents, see a letter, get insurance, but they were willing to support us. The ease of organizing people around change and the necessity of doing good helped me see that social change was the path for me. It was kind of like stepping into my purpose; and it was fun. How has your role as an activist evolved? I think every day we all walk closer to our purpose. My purpose of social change and social justice is out of necessity. In a perfect world we wouldn’t see such inequities so I could go read a book on a beach maybe I would do something else with my life—I don’t know because that world doesn’t exist. When there’s so much going on you feel called. You think, I have to do something. So my role as an activist evolves as I better understand where I fit in this world. When I was young I was fearless, and I still somewhat am fearless, but now I understand the stakes more so sometimes it’s natural to be a little scared of the cost of activism. However, whether it’s for the Black Lives Matter Movement or in philanthropy at the Women’s Foundation of Minnesota working on issues related to women and girls. I try to show up fully as myself, bringing my people and heart with me. I try to be accountable to community. And I try to remember that while sometimes it can be scary, that silence is not an option. That to be silent about injustice is even scarier. What’s a powerful value your family modeled for you? Community. I’ve seen people who have the least have the strongest sense of community -- because it’s necessary for survival. It’s something I’ve seen modeled from when I was a little girl in East Africa through the communities I am a part of now. My mom taught us that family aren’t only blood relatives. Growing up, our home was open to everyone. When I think about my work now, I don’t want to be with a bunch of strangers sitting in a boardroom accomplishing a task and leaving… it’s about creating that same sense of community so that whatever work we’re moving forward is with love. It makes it harder to do wrong when we have a stake in each other. You’re active in so many political, professional and philanthropic initiatives - what’s the common thread for you? I am deeply invested in the well-being of women of color and black women because everywhere in the world we experience a very distinct kind of hardship. I have so many parts of my life [laughs]. 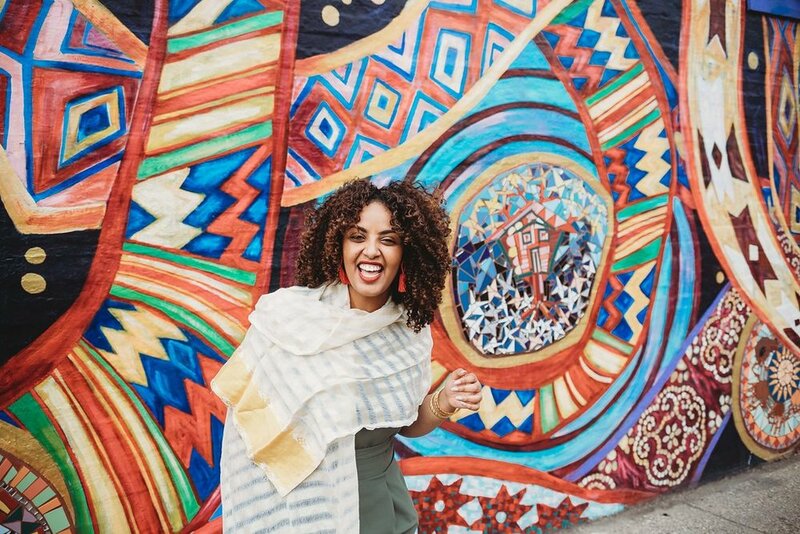 One minute I’m working as the Director of Community Impact at the Women’s Foundation of Minnesota, the next I’m on a highway protesting with Black Lives Matter, then I’m in Ethiopia with my family or I’m hanging out with my friends doing brunch on Sunday and ordering breakfast and complaining about the weather or downloading the latest app on my phone. I guess a common thread is bringing myself wherever I go. I have to bring all of my experiences, all of my people, all of my values into my work. I have to be myself. My values of social justice aren’t just what I do nine to five, it’s what I do five to nine. It’s about how I treat people, where I choose to spend my money, the people I surround myself with, it’s a lifestyle. What’s on the horizon that you’re most excited about? I think women of color are saving America. I really do. In the midst of a lot of chaos with political leadership that just doesn’t give us confidence, safety, or stability, it is women of color who are stepping up and saying, "we won’t take it and we are going to fight back". Whether that’s women running and winning seats in political office, say Andrea Jenkins or Congresswoman Maxine Waters denouncing racism, sexism, and hatred and helping us reclaim our time – I even think of young women like Emma Gonzales, the young Latinx woman from Parkland, Florida who is leading a movement against gun violence in schools. I’m excited that the world is finally recognizing the contributions of women of color. We’ve always contributed significantly but I’m excited the world is finally recognizing it. It’s in our best interest to support and invest in women of color. And frankly it’s for the better – none of us are free until we are all free. They say behind every successful woman is a tribe who has her back. Who are those people for you? Definitely my mom and my sister. They are amazing women and very different from me. My sister is like, “I want to raise my Black babies, love my family, love God, and take care of my home”. And I love that because Feminism and liberation comes in many forms. While she is very different from me, she loves and supports me from wherever she is. My mom raised me to be a feminist. She taught me how to speak up and stand up not only for myself but also for others. That doesn’t always mean she understands my activism. For example, when I was in college (author’s note: the trip was part of Lulete’s Ibrahim Leadership and Dialogue Project Fellowship with International Institute for Education) I went on this trip to Palestine and Israel and during this particular time, there was a lot of violence in the region. My mom was so worried about me, she would ask “Why do you treat your mother like this? Must you go to dangerous places and worry me?” She thought I was out to make her life harder [laughs], but they are both super supportive. I also owe a lot to my sisters in the movement. I learn from brilliant women all the time. I know how to humble myself. I am never scared to say, “I will follow you”. That’s my favorite thing to do, to follow the leadership of women I think it’s relaxing because I know they’ll get things done! [laughs]. I especially admire the Black and Queer women leading the movement for Black lives. I know some of them personally, they are friends and heroes of mine, I am grateful to learn from history-makers like them. I also am grateful for my local tribe members like Ilhan [Omar]. She’s achieved so much and still has time for me. I see her like a big sister, although she wants me to call her auntie since she is 10 years older than me; I refuse. My colleagues at the Women’s Foundation also have my back in a very special way. Even when we have a difference of perspectives they don’t make me feel like I have to be small. Not only am I valued as an employee at the Foundation, I also believe I am deeply loved. Can you believe that? Someone can be deeply loved at their place of work by their colleagues and leaders? They let me be myself and teach me at the same time. Right out of college, I was an Intern at the Women’s Foundation, then I became a Reatha Clark King Fellow, a program specifically designed by WFMN to get more women of color into the sector of philanthropy. That position was part time so I also began working with VoteRunLead and organizing to train women to run for office here in Minnesota, and at the height of many BLM protests in St. Louis/Ferguson. That experience solidified my passion and commitment in supporting women to run for office and be in leadership. Soon after, I finished my fellowship and started at the Greater Twin Cities United Way in a Public Policy and Community Engagement Manager role. After close to two years on the job, WFMN approached me about my current position. It was pretty hilarious. They took me out to lunch. No matter how much you believe in women’s leadership, no matter how badass you are, the first thing we do when we hear of opportunities is say, “Oh no. I’m not qualified” or “I’m not ready”. It’s so bad and I want to break that habit- but I am also a victim to that type of gendered social conditioning! So, we’re out at lunch and I was eating a burger because I thought they just wanted to have lunch with me to catch up. I ordered this big burger with onions and toppings so here I am just enjoying my life and they’re like, “we’re here to talk with you about a position.” I wish they would have told me so I could have ordered a salad! I’m literally wiping the ketchup off the corner of my mouth. I was like, “you are? !” They said, “we think you’d be qualified, we know it would be a career transition, but here is why you’d be a perfect fit.” They laid out their reasoning and convinced me to apply. I’m glad I did because I am at my dream job. I’m grateful every day to do what I love with people I love. I really am. What makes you proudest to work at the Women’s Foundation of Minnesota? The work the Foundation does it so critical. We work hard to advance gender and racial equity across Minnesota. We achieve this through grantmaking, public policy, research, and by bringing community change makers together. We are really hard-working people who are all personally passionate and invested in the cause. The commitment is inspiring and motivating. The communities that we serve and partner with deserve our commitment. Some days I feel like I’m in the graduate school of my life. I learn so much from my colleagues and our community partners. I especially appreciate our CEO, Lee, and our VP Saanii. They are some of the smartest people I know. I feel like it is a privilege to design systems-change work with them. I also have the opportunity to manage the positions I once held -- our Reatha Clark King Fellowship and our Wenda Weekes Moore Internship. It’s very special to work with women of color entering the field of philanthropy and I commend the Foundation for doing it with intentionality. What’s something your friends come to you for advice on? Omg -- all things social change and social justice! My friend Addis for example says she never has to look at the news because all she just has to go to my social media feed and she’ll find out everything that is happening in the world. she’ll say, “I don’t have to do anything cause you’re doing it. 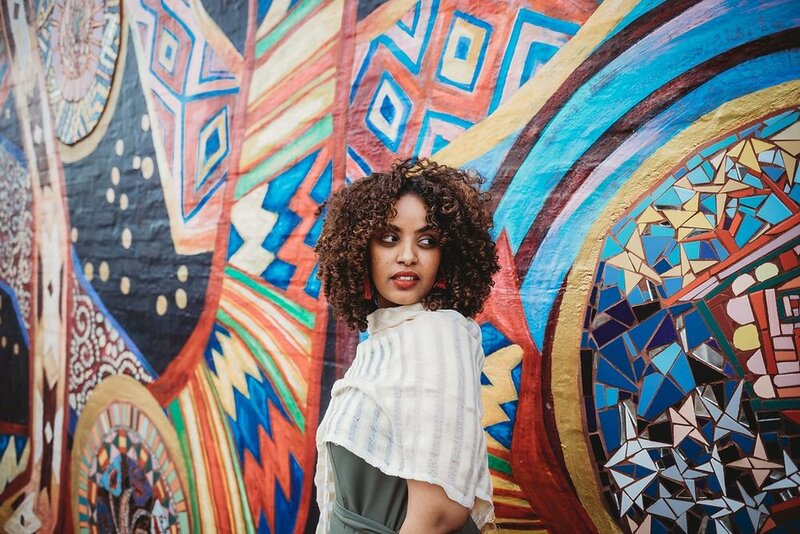 I can just go to bed and live a peaceful life because I know you got it.” In the Ethiopian community especially, I’ll be out at a bar or dance party having a night out with my girlfriends and it’s common that people will interrupt me to ask about President Trump or if I can direct them to this or that resource. My mother tells everyone I can help them with everything -- whether its housing or jobs or good hair products. She gives my business cards out more than I do. I don’t know how she got a stack. Two things she’ll say to you if she meets you 1) I’ll make you coffee (because we make a special Ethiopian coffee in our tradition) and 2) Call my daughter Lulete. Describe your perfect girls’ night. I love going traveling to different parts of the U.S. places like Atlanta or D.C. The demographics are so different. It’s really critical to see yourself reflected. One of the things that’s hard about Minnesota is that the disparities are so significant for people of color in terms of health, education, wealth, etc. So if you are a Black professional, you don’t get to go to the bars or to many social scenes in Minnesota and see other people who look like you and that’s not easy. So, I love going to places like Miami, or California. Or here (referring to Breaking Bread)! There are so many people from different walks of life. 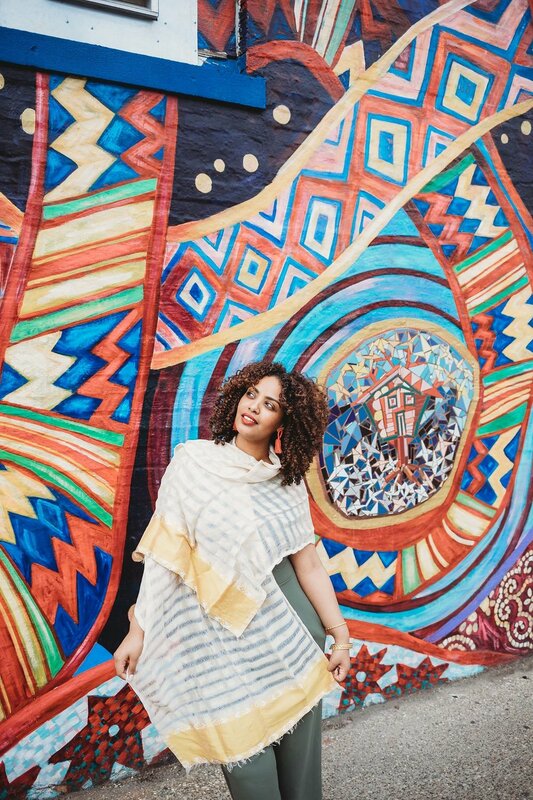 I also love Somali restaurants, two of my favorite spots are Afro Deli and Safari Restaurant. The dishes are a lot of rice, meats. I love going to culturally-specific places. Bole is another one. It’s a newer Ethiopian restaurant. I love the owners they are such kind, loving people and they have two beautiful daughters. I love a night in, too. I love watching shows like HBO’s Insecure, or Living Single on HULU, a show from the 90’s. Both are shows about young women of color living life and making average 20-something mistakes. I love it because we are not afforded that reflection. In the summer, we have a black girls magic night where we watch Insecure – it’s fun, we debrief it, we yell, we scream at the drama of the show, we laugh, and we cook. That show means so much to a lot of us. Something I’m working on is that I work a lot. I’m still working on self-care. I think sometimes when you’re so invested in system change that you forget the very people in front of you. So, I’m working on simplifying how I view things and spending more time with the people I love in my life. When the trial to bring justice for Philando Castile in St. Paul ended and the officer who murdered him was found not guilty we were heart broken. I mean Philando was shot to death in front of his partner and their little girl and it was all caught on a video— all the evidence was there to show the severity of the injustice and yet the system deemed it a just murder. My friends and I felt helpless. It was one of the most helpless feelings I have ever felt in my life. Usually you’d protest you’d go to the streets you’d organize you’d figure something out. I remember that day we instead went to my friend’s house to play cards. We felt deeply impacted by the decision, but instead of burning ourselves out and hurting more we decided to gather together and play cards and have good food and have good wine and be in community and just love each other. Two days ago, Stephon Clark was shot in his backyard, he was a young man who was also a father of two boys. The police claimed they thought his cell phone was a gun. The video was released, but I didn’t open the video to see him get shot. I was already sad I’m still in mourning and thinking about my brother in law my little cousins and my nephew- I mean, what if cops mistake their cell phones when they are in their backyards and kill them? It’s hard. At this time in my life I can’t say I am practicing self-care, what I am practicing is harm reduction. There’s a quote by Audre Lorde, “Caring for myself is not self-indulgence, it is self-preservation, and that is an act of political warfare.” I think of that when I’m taking a day of rest. We think about food, water, job as basic needs but healing and well-being is also essential. Too often we think of it as extra. What do you love most about MSP? We are some of the most resilient people in the US. We have the first Muslim Congressman Keith Ellison; the first Somali-American Muslim woman legislator Ilhan Omar; the first transgender woman elected to major U.S. city council Andrea Jenkins and Council Member Phillipe Cunningham, the first Black transgender man to serve in any political office ever! With all of our problems and disparities, people are really invested in each other and there are groups of people that do so much to counter what is bad about our region, so you can find havens like this (Breaking Bread Cafe) of people coming together to dream of a new world. I also love the summertime in the Twin Cities. I love our vibrant immigrant communities - Ethiopian, Somali, Liberian, Mexican, Hmong folks and more. We have a caring, loving community and I think that’s what keeps me here. I stay because of the people. What would you change if you were in a position to do so? The deep inequities. The trajectory of people of color, Black and Native people, in particular, is so bad here. So bad. So bad. For example, Philando Castile went to St. Paul Central and Melvin Carter went to St. Paul Central. That’s a big part of my identity. I have friends from every race and background from Central. I would have sleepovers with white friends, black friends, African friends. Now we’re all in our careers, but there is a significant difference between how my middle class white friends are doing and my black and immigrant friends. My white classmates are entering medical school, they’re in New York, they’re getting married, they’re buying a home, they’re doing all the things that people should be doing at our age. Of my black and immigrant friends, there are only a few of us who are economically making it. So, to read about the disparities is one thing, but to see it within my friend group is another thing. There is a drastic difference in how people are doing even though we all went to the same high school and basically grew up in neighborhoods not too far from one another. Equity is something we should all embrace. Policy Link calls it a superior growth model. Equity is about systems giving folks what they need so they can thrive in a just and fair society. I wish that our cities and our state were more committed, but that’s why I’m at the Women’s Foundation of Minnesota because that’s our job to push this forward. Power of 100 is all about learning and growing. What’s something you’re making time to learn to protect yourself against burnout? Lately I have been forcing myself to go to creative spaces. Last year I attended Summit 21 put together by Blavity, which is basically the black BuzzFeed. The conference was in Chicago and this year it’s in Atlanta. I am learning more and more about how to merge lifestyles with social change. For example, personally, I’m planning a retreat for black women in September with a friend. We’re going to take ten women to greater Minnesota and we’re going to rent a lakeside cabin. We are going to spend the weekend laughing and loving and healing and talking and doing yoga and all these things that we don’t really think about so we can recharge and then come back into the world. And that’s totally out of my character. If you would have asked me two years ago, I would have been like, “I don’t have time for this, I’m out here trying to change the world. I don’t have time for a retreat in greater Minnesota!” Now I understand how these things merge and how necessary they are and want to exercise other parts of me. I want to be a leadership coach. I want to create beautiful things and be with my friends. So, I guess the things I’m excited to learn more about and bring into my work are technology, and creativity and retreat. As we build Power of 100, how can we apply the “Lulete doctrine”, which is as you say: to champion social change that is intersectional, asset based and led by communities most impacted? [Laughs] You’ve done it. That’s a big question. I realize I am being really raw with you. I was honest in this conversation and I’m glad. I said today systems were created to marginalize women and people of color and that black people are being shot. I hope part of your work is to make people uncomfortable, quite honestly, because that’s the world we’re living in. Because they should be uncomfortable. It’s only when you’re uncomfortable that you do something about it. Often we sugar-coat things. So, when you’re engaging people it’s not always about what feels good to hear. A lot of people engage in philanthropy to feel good and I think that’s okay. Sometimes it’s about learning something new. Sometimes it’s about stepping out of your comfort zone. And understanding that my story of social change is very different than your story of social change and both of them are valid. And both are relevant in Power of 100. So what I would say is for the perspectives in the interviews just to be holistic of how different people are. I encourage you to present those differences to your audience in that raw way with the risk that they may say, “you know what -- I really love you, and I think what you’re doing is great, but I’m not going to join you.” And for that to be okay. The best thing white women can do is to organize each other. Not come into the hood and plant a garden [laughs]. Go talk with your friends and family because people listen to people who look like them the most. So whenever people who are progressive ask me, “what can I do?” I say: organize each other. Talk to each other. Because you can say the same things I’m saying and you will be heard differently. I think what Power of 100 is doing is awesome. Another thing -- I think every person should work to understand their privilege and how they navigate the world each day. How they can choose to navigate it differently than some people experience the world. What they do to have one less hardship each day. That stuff matters. And of course, give your money. Yes. However much you can, give to causes you care about. I would say, don’t always assume it has to be 501(c)3 non profit. It could be a political campaign, a gofundme, an organization of girls that just started and doesn’t have a track record of success yet, directly to Black and Native women via venmo or cashapp or an event put on by an organization you’re excited about. Or join a board. And work on self-reflection on how we can push equity forward every day. Think about our history of racism and of sexism. Ultimately, the personal decisions you make about how you treat women and people of color in the workplace, on the street, in church is what will make the biggest difference and shift culture so we can all experience this world differently and a bit better. Find Lulete keeping it 100 on Twitter at @WhenLulaWerks. The Women’s Foundation of Minnesota is a statewide community foundation investing in innovation to drive gender equity. Through grantmaking, research, and public policy, the Foundation builds pathways to opportunity and economic prosperity for all girls and women in Minnesota. More at WFMN.ORG or on Facebook, Instagram and Twitter at @womensfndnmn. Images by Gwen Cox for Power of 100 MSP.